Your dad does what?” is usually the response I get after telling someone about my dad’s job. My dad is an Ocularist. An Ocularist is a person that fits and fabricates custom artificial eyes. 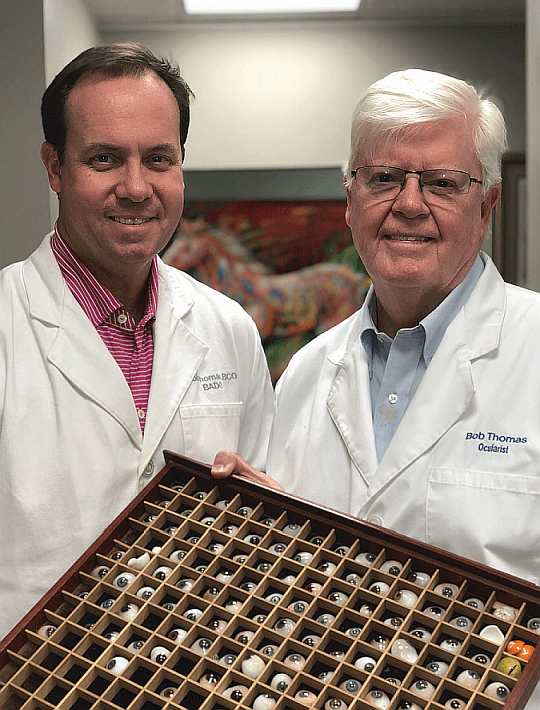 Both my father and grandfather, Rob and Bob Thomas, work together in their practice, Thomas Ocular Prosthetics here in Memphis, Tennessee. They also have satellite locations in Johnson City, Tennessee, Little Rock, Arkansas and Jackson, Mississippi. My dad is often asked what made him go into this field. “I always enjoyed going into the office with my father when I was young-er and seeing the impact he had on people’s lives”, my dad said. My grandfather was introduced to the field when he was a dental-tech in the Navy. He even went into prosthetics while still serving. Out of the Navy, my grandfather worked in New York City until moving to Birmingham Alabama in 1972. While in New York, he had the opportunity to work with both Sammy Davis, Jr. and Peter Falk. Both of these men were celebrities that suffered an eye loss.Each eye is custom fit to the individual’s socket. An impression mold is made of the socket and then a wax shape is used to fit the prosthesis. After the shape is converted into acrylic, the eye is hand painted to match the fellow remaining eye. This is where the eye starts to look real in appearance. The red veining is made from red thread, and a series of washes with a pigment-ed paint is used to match the patient’s remaining eye. 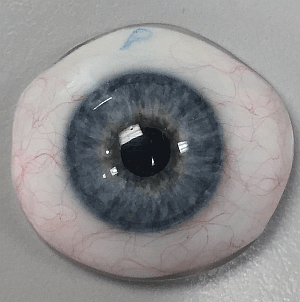 The process of making an eye has often been described as both medical and art: medical, because the eye is made to fit the person’s socket; art, because the eye is handmade, custom fit and shaped, and painted to match the natural eye as close as possible, even down to the pupil. Some individuals say they feel like they are sitting for a portrait. Memphis is known to have a major medical community with UT Health and Science, Le Bonheur, and St. Jude. At St. Jude, they research and treat childhood cancers. One cancer that they treat is retinoblastoma, a childhood cancer that occurs in the retina of the eye. Many times the eye has to be removed to save the life of that child. The doctors at St. Jude refer those families to Thomas Ocular for the artificial eye and they continue to be seen there during their scheduled return visits to the hospital. “We like to see a patient every six to twelve months for proper care and maintenance of the prosthesis”, my dad tells me. With little children, as they grow and develop, the prosthesis may have to be adjusted or enlarged to help develop the socket until it’s time for a replacement, which is every five to seven years. Some patients started seeing my grandfather when they were just two or three years of age and are now in their forties with families of their own. So many of their patients live normal lives and don’t look at the prosthesis or loss of an eye as a disability. Many live normal lives with their friends and family not realizing they are missing their natural eye and wearing a prosthetic eye. Some will say that often times a family member will forget they can’t see out of that eye. “Restoring a person’s appearance and giving them their self-confidence back is an amazing feeling”, my dad says. Today, there is such an emphasis placed on social media with pictures and appearances, no one wants to feel or look different. It is amazing the impact a piece of plastic can have on a person’s life. Both my father and grandfather enjoy what they do, but it’s when their work goes unrecognized that they feel the greatest fulfillment.